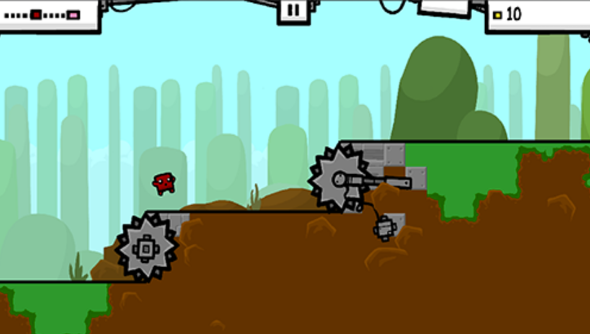 Team Meat have announced a new game at PAX 2014 this weekend: Super Meat Boy: Forever. Conformed as coming to Steam next year, the game aims to capture the feel of the original Super Meat Boy, but “without the use of multiple buttons”. Quite what this means is unclear right now, but one thing is for certain: alongside the Steam release, Super Meat Boy: Forever is releasing on phones and tablets. This new, analogue stick-free Meat Boy won’t be a one-button affair stress Team Meat, so if you feared that the notoriously challenging side-scroller was devolving into Jetpack Joyride then calm yourself down. As the name Super Meat Boy: Forever suggests though, it will feature an endless mode, although that’s not the game’s sole identity. Levels will be randomly generated over six chapters, with a story and twice as many bosses as the original game. The art style appears to have been changed too, with a much cuter design and thick black outlines to every shape.